WELCOME TO MY MONEY MISSION ONLINE: THRIFTY THURSDAY.....AND NEW FOLLOWERS! WOO-HOO!! THRIFTY THURSDAY.....AND NEW FOLLOWERS! WOO-HOO!! GOOD MORNING! I was so excited to see that I have two new followers! I'd like to give a Big WOO-HOO Welcome and HELLO to Jack over at cigamybab and Cen over at censloft. If you have time today, cruise by their blogs and say hello!! I have been noticing that gas prices are coming up again (ugh!) and with summer vacation fast approaching, I have been scouring the internet for ways to get the most mileage from my aged-but-still-running 1998 van. As I was googling and exploring, I came across some interesting articles that I thought were interesting. When you fill up with gas, fill up completely and try and keep your tank above one third full. If your fuel runs low, the engine might not receive a steady supply of gas (since it will splash around while you're driving and it might momentarily splash away from the tube that leads gas out of the tank). Not having a steady supply of gas will make your engine less efficient. The benefits of having a full tank will outweigh the drawbacks of having the added weight. Lighten your load. Get the lightest car that will serve your needs. Weight is one of the biggest causes for loss of kinetic energy in non hybrid cars. If you're not shopping for cars, then take any extra weight off of the one you're already driving. If seats that you don't use can be removed, take them out. If you use your trunk as a storage space for heavy things, find another place for them. An extra 100 pounds increases fuel consumption by 1-2%. find gas cards - some of the best gas credit cards are listed here. I'm telling you what, Brandie, over at free sample freak is the queen of all things free! I was visiting her blog today, and she has got the best deals posted. Here are a few that I found interesting! YAY! June 3rd is National Float Night! 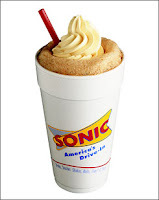 Go to your local Sonic and get a free 10oz Root Beer Float! Offer is good from 8pm to closing time. Sign up for the Sonic Cruisers Fan Club and get a once-a-month newsletter with coupons, promotions and more. Also, you'll get a special freebie on your birthday! Starting at 9 am, Burt's Bees is giving away 25,000 Burt's Bees beeswax lip balms! They are giving away 25,000 lip balms in 25 days. It's a sweepstakes, because 1,000 are randomly given away each day between 9 am and Noon EST. But, I think you can enter each day. There has been alot of confusion about this one, but between Brandie and Heather at freebies4mom, I think I have got this figured out now! For your Northeastern followers... If you have a Shaw's Supermarket, you can earn gas rewards. For every $50 you spend **IN ONE SHOPPING TRIP** you will earn a $0.10 per gallon reward up to 20 gallons. So if you spend $50, you get 10 cents off, if you spend $100 you get 20 cents off, etc. It takes 30 minutes from purchase to become effective and can be redeemed at participating Gulf and Irving Stations. If you go to the customer service desk at your Shaw's they can give you a list of local participating stations and help you get a Shaw's rewards card that you'll need to redeem your rewards. BFF and I have been using this (and we don't do the bulk of our shopping there!) and it is a great way of saving a couple more bucks off your gas, just for buying things you normally would! Nique, THANKS FOR THE GREAT TIP! I have heard of Shaw's, but we don't have one here. My sis Danesa gets gas rewards when she shops at her local Krogers, in Ohio. I'm going to have to check to see if they offer this at the big town that is next to my small town! Stopped by to read up on what you are doing! Congrats on all the new followers. Came over from Boondock babble love that lady and am so glad I found her and now you as I absolutely am obsessed about bargains as I can't stand what's happened in this country. Hugs and I'll be back (bookmarked you) hope you'll visit my site and comments will be changing front page soon...making it better we hope.